Researchers develop ‘injectable’ blood vessels. Rice University scientists have developed a hydrogel that can be injected into an internal wound and help it heal while slowly degrading as it is replaced by natural tissue and blood vessels. Hydrogels are used as a scaffold upon which cells can build tissue. The new hydrogel overcomes a host of issues that have kept them from reaching their potential to treat injuries and forming new vasculature to treat heart attack, stroke and ischemic tissue diseases. The study is published in the journal ACS Nano. The lab’s hydrogel is made of a self-assembling synthetic peptide that forms nanofiber scaffolds. Like earlier versions, the material can be injected in liquid form and turns into a nanofiber-infused gel at the site of the injury. Without blood to deliver oxygen and nutrients and carry out waste, new tissue growth is limited. So synthetic peptides that form the hydrogel incorporate a mimic of vascular endothelial growth factor, a signal protein that promotes angiogenesis, the growth of a network of blood vessels. In simulations and lab tests, the material was found to work extraordinarily well. The team state that one thing that differentiates the work is the quality of the blood vessels that are formed. In a lot of the published literature, rings that only have the endothelial cell lining are often seen, and that indicates a very immature blood vessel. These types of vessels usually don’t persist, and disappear shortly after they show up. In the current study the same endothelial cell layer was observed, but surrounding it is a smooth muscle cell layer that indicates a much more mature vessel that’s likely to persist. The team state that in previous studies, implanted synthetic materials tended to become encapsulated by fibrous barriers that kept cells and blood vessels from infiltrating the scaffold. That is an extremely common problem in synthetic materials put into the body. Some teams avoid this problem but if the body doesn’t like a material and isn’t able to destroy it, the solution is to wall it off. As soon as that happens, the flow of nutrients across that barrier decreases to almost nothing. So the fact that the team have developed syringe-directed delivery of a material that doesn’t develop fibrous encapsulation is really important. Characteristics of earlier hydrogels, including unwanted immune responses, surface degradation preceding their integration into biological systems and the release of artificial degradation byproducts, have also been eliminated. The team surmise that there are a lot of features about this hydrogel that come together to make it a unique system. If the medical community look through the literature at what other people have done, each concept involved in the new system probably exists somewhere already. The difference is that the current study has all these features in one place working together. The proposed mechanism of healing in hydrogels developed at Rice University starts with (A) injectable peptide scaffolds that form nanofibrous hydrogels. 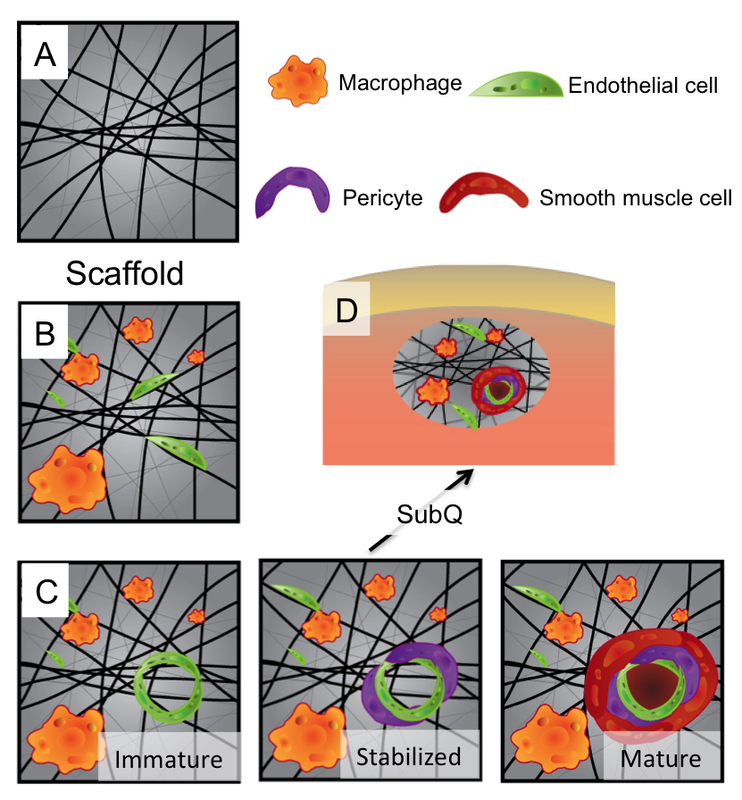 (B) Macrophages and endothelial cells infiltrate the scaffold. (C) Vessels progress from immature (endothelial cells only) to stabilized (endothelial and pericyte cells) to mature (endothelial, pericyte and smooth muscle cells). (D) Mature neovessels rapidly form in just seven days in the subcutaneous model. (Credit: Vivek Kumar/Rice University).